In 2010, House Bill 133 was passed and enacted. The bill provided Ohio with a formalized process to determine if oil and gas activity was suitable on public lands. Before HB 133, Ohio’s Department of Administrative Services (DAS) was the sole arbiter of leases, which usually entitled DAS sending the agency in question a boilerplate contract for such an agreement. HB 133 looked at this practice and created the Oil and Gas Leasing Commission. The panel was comprised of two representatives of the oil and gas industry, a representative knowledgeable in finance or real estate transactions, an environmental or conservation interest, and the Chief of the Division of Geological Survey, who would Chair this group. Collectively, the Commission would harness these perspectives and decide if an oil and gas lease would be beneficial to enter into with an operator. This analysis would be vital to both the success of the program and the quality of offers accepted and entered into by the State of Ohio. For example, conceptually the oil and gas industry representatives would provide the Commission with information regarding the drilling of the well, setbacks, and other details pertinent to drilling and operating an oil and gas well. The member representing real estate or finance would provide the Commission with information on the lease, as in what is a reasonable amount for the state to receive with the lease or other contractual provisions. The environmental or conservation interest would bring a perspective of these state lands, as in is it feasible to lease here or, if a lease can proceed, what additional safeguards should be discussed. In summary, the Oil and Gas Leasing Commission was established to create a formalized process for various interests to begin a discussion about if an oil and gas lease should be entered into on certain state lands. Communication between these interests, the state, the regulatory body, and the general public is the central notion of the program. Now that one individual has been appointed, it is our hope that more appointments follow so that this important discussion can take place for the benefit of Ohio and its citizens. Has the wasteful spending of valley tax payer dollars stopped and sanity finally come to the City of Youngstown on this issue? The answer is yes. The Ohio Supreme Court ruled on Friday that the seventh attempt to ban oil and gas extraction from within limits does not belong on the ballot. In a 4-3 decision, the Court ruled that all or part of the charter amendment falls outside the scope of the authority of the City of Youngstown therefor the amendment to the city charter should not be placed on the ballot. It is like Christmas in October for the city leaders who have been forced to tighten city budgets on the various needs of the city due to the over $187,000 spent, according to Energy in Depth, on official notices and Election Day expenses over the last six election cycles. The “corporate state” as Mrs. Beiersdorfer puts it, did not draft the so called “Community Bill of Rights” and in fact had nothing to do with the entire effort or the fact that court disagreed with the proposal. The “corporate state” was and is too busy putting the hard working people of Youngstown and the greater Mahoning Valley to work assembling cars, rolling steel and building power plants. Out of state lawyers for the Community Environmental Legal Defense Fund (CELDF) wrote the documents, Beiersdorfer helped spearhead the campaign. Businesses big or small are not to blame for this end results. After seven attempts and garnering less wins then the Cleveland Browns, it might be time to stop and take note. That is seven spent summers collecting signatures and seven falls campaigning the message, some would say agenda, yet it continues to not resonating with local voters, chambers of commerce, labor unions, their own Mahoning County Board of Elections and the Ohio Supreme Court. Oil and gas is not the enemy in Youngstown, as voters have proved time and time again. Ray and Susie both have positions of influence at Youngstown State University where they are in front countless students who are the next generation of leaders for the Mahoning Valley. They should challenge them to rebuild their community, engage them to be the agents of change for the betterment of the entire region, driving it forward instead of just spinning their wheels. While CELDF continues to rack up big money in their political accounts and losses in Ohio (5-28 by our count) many county boards of elections, court of common pleas, court of appeals, the Ohio Secretary of State, the Ohio General Assembly and the Ohio Supreme Court have all said the efforts do not comply with state law. The message to the CELDF and the dwindling amount of followers, stop trying to spread misinformation, stop trying to sell the so called “Community Bill of Rights,” stop wasting precious tax payers dollars because no one is listening anymore. 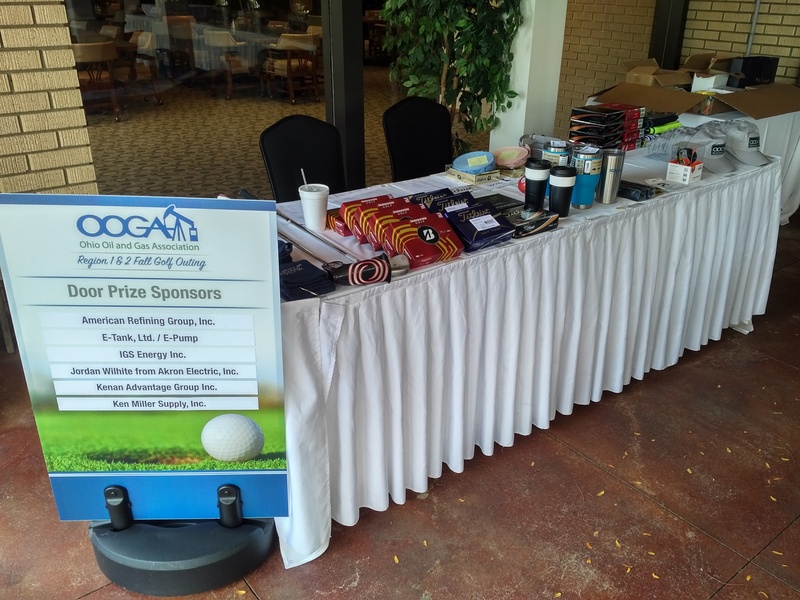 The OOGA held its annual Region 1 & 2 fall Golf Outing at Shady Hollow Country Club in Massillon last Friday, September 22. The event was very well attended with more than 75 golfers out on the course. The golf outing previously run by Frank and Doug Gonozalez, owners of GonzOil based in Canton was passed onto the Levengoods, owners of Sound Energy Company, Inc. based in Dover. Tyler Levengood spearheaded along with his brother Nate, enthusiastically stepping up as the new organizers, reinvigorating the event for all generation to partake. The Levengoods moved the event to a new course, added event sponsors and brought in new raffle with some great prizes. The Association would like to thank everyone who attended and participated in the 2017 Region 1 & 2 Golf Outing or contributed to its success. Finally, a big thank you to our main event sponsors including: American Refining Group, Inc. for providing lunch and Ergon Oil Purchasing, Inc. for providing beverages. We look forward to seeing you at our next OOGA event—the Technical Conference and Oilfield Expo, being held on November 1-2, 2017 at the Pritchard Laughlin Civic Center in Cambridge, Ohio. The U.S. Energy Information Administration (US EIA) released the latest edition of its International Energy Outlook 2017 (IEO2017) that is an assessment of outlooks for international energy markets. The IEO2017 is a compilation of long-term world energy markets, including projections for 16 world regions. The biggest take away is that world energy use is projected to increase 28% by the year 2040. That is a rise from 2015 global energy consumption at 575,000,000,000,000,000 (quadrillion) British thermal units (Btu) to 736 quadrillion Btu in 2040. Much of the growth is driven largely by increased demands in China, India and other Asian countries. The increased energy consumption will come from all fuel sources, with the exception of coal demand that remains basically flat. Renewables are expected to be a fast growing source, along with nuclear power, yet the world will rely primarily on fossil fuels as its principal energy source well into the future. Fossil fuels are expected to account for 77% of energy use in 2040, with natural gas rising considerably. Natural gas is the fastest growing fossil fuel in the IEO2017 outlook. Global natural gas consumption is expected to increase 1.4% per year, due to abundant natural gas sources and rising production. 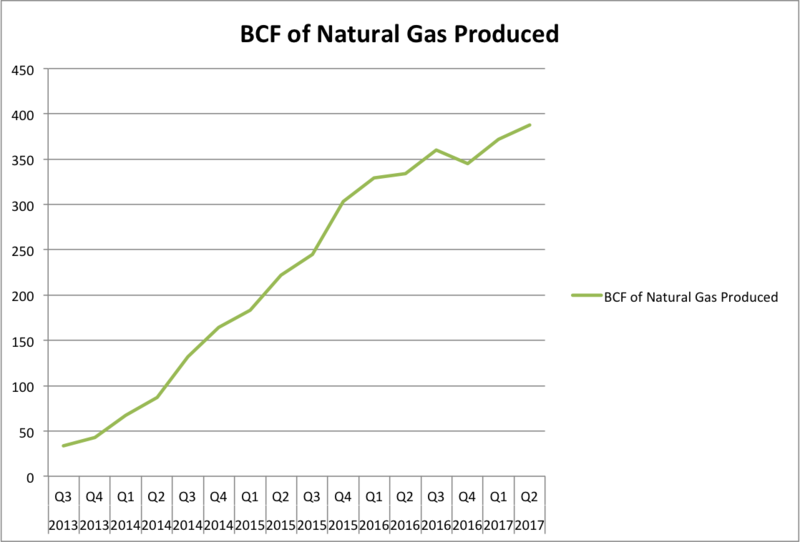 In the United States we are seeing a rebound from where the industry was last year at this time, and U.S. natural gas production was projected to increase to a record 59.7 billion cubic feet per day (bcfd) in October. This is up from September and reflects the upward trend that we have been seeing for the past seven months. Also not in the forecast of their report is a peak in global oil demand. 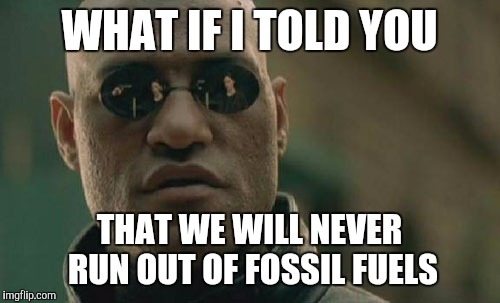 Petroleum and other liquid fuels will remain the largest energy source throughout the next two decades, based on IEO2017 predictions. To the tune of the world using 95,000,000 barrels per day (b/d) in 2015, to 104 million b/d in 2030 and 113 million b/d in 2040. To satisfy this growing energy demand, the world needs a production increase by 16.1 million b/d from 2015 to 2040. The United States is contributing to meet these energy needs, seen in the US EIA’s monthly drilling report, Shale production is set to rise for the 10th month in a row in October. The seven big shale plays across the states are forecasted to bring a rise in monthly production by nearly 79,000 b/d, totaling 6.1 million b/d. On a local level, we’ve seen a modest increase in production in 2017. The latest quarterly results from the state show Ohio producers recovered 4,044,072 barrels of oil and 388 bcf of natural gas, spanning April 1, 2017 through July 31, 2017. The production results are a positive sign for our industry, as 2016 ended with the industry seeing both oil and natural gas production decrease. The predictions from the IEO2017 are another set of data points in a larger on going discussion of what our world’s energy future needs to, and will look like. I encourage anyone interested in learning more to view the full report. The Marcellus Shale Coalition, the Ohio Oil and Gas Association and the West Virginia Oil and Natural Gas Association are hosting the SHALE INSIGHT conference on September 27 and 28 in Pittsburgh, Pennsylvania. 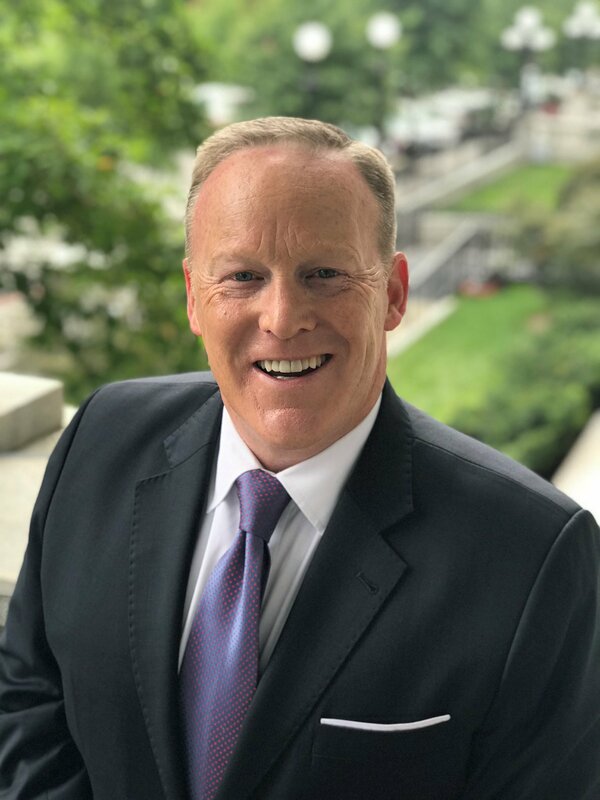 Sean Spicer, former White House press secretary, will be the closing keynote speaker at the conference. Sean Spicer officially stepped down from his White House post and one of his first public appearances is at SHALE INSIGHT. Spicer will touch on how we are poised to strengthen our nation's geopolitical position, create manufacturing opportunities here at home and jobs for all Americans while continuing to protect our environment. Everybody knows Sean Spicer. At least, polls show, they know his name and his trademark style behind the White House podium. But before the former White House Press Secretary made his mark as one of the most recognized staffers in the Trump administration, he built a decades-long career in Republican politics, witnessing and shaping the inner workings of Washington, DC, from every vantage point--as a House of Representatives communicator, Assistant U.S. Trade Representative, Republican National Committee chief strategist, top advisor to presidential campaigns, and, of course, White House spokesman. Few in Washington are as well-equipped as Sean to pull back the curtain and dissect what’s really happening in the nation’s capital. Sean is a lifelong Republican operative who worked his way up through the ranks and whom colleagues know as relentless, quick-witted and good-humored. Melissa McCarthy’s depiction of his press briefing performances earned him a spot in Saturday Night Live lore, but it was his role as the architect of the Republican National Committee’s PR strategy that earned him a reputation as one of the party’s most effective and hardest-charging strategists and communicators. He helped the party successfully rebuild following losses in the 2012 election, and he then played a key role in the strategy behind the party’s sweeping 2014 victories, the must-see 2016 primary debates and the party’s improbable wins across the country that November. Outside of politics, Sean serves as a commander in the U.S. Navy Reserve. A Rhode Island native and Connecticut College graduate, he also holds a master’s degree from the Naval War College. A husband and father of two, he resides in Virginia but remains a loyal fan of the Boston Red Sox. The latest oil and natural gas horizontal production numbers released by the Ohio Department of Natural Resources (ODNR) Division of Oil and Gas Resources Management show a modest increase in production from where we left off in March of this year. 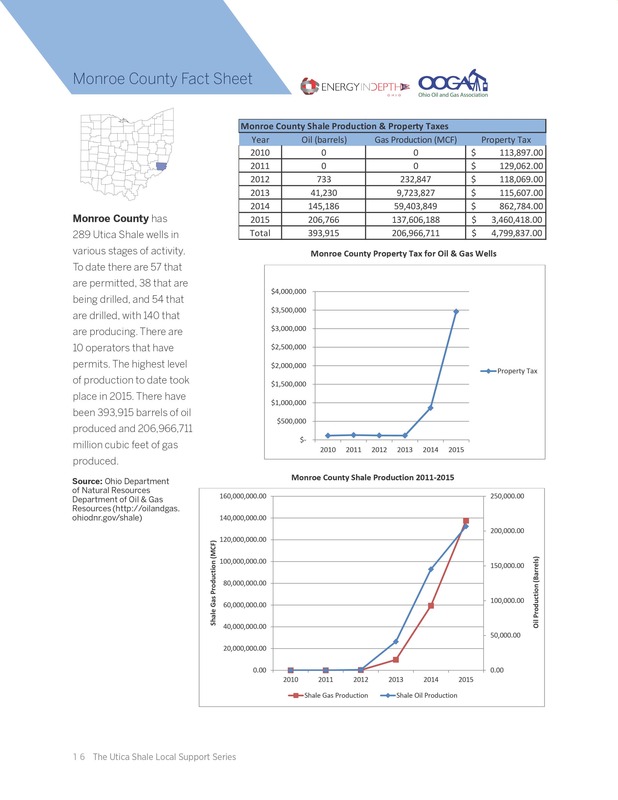 The quarterly results show that Ohio producers recovered 4,044,072 barrels of oil and 388,560,451 Mcf (388 billion cubic feet) of natural gas, spanning April 1, 2017 through July 31, 2017. The production results again show a positive sign, as we left 2016 seeing both oil and natural gas production decrease for the first time since ODNR began recording horizontal production numbers. There was a slight production increase of 4% for oil (up from 3,904,732 barrels) and 4% for natural gas (up from 372 billion cubic feet). Yes, we are up from the lowest point thus far, which is reassuring but production is still slowly rebounding. 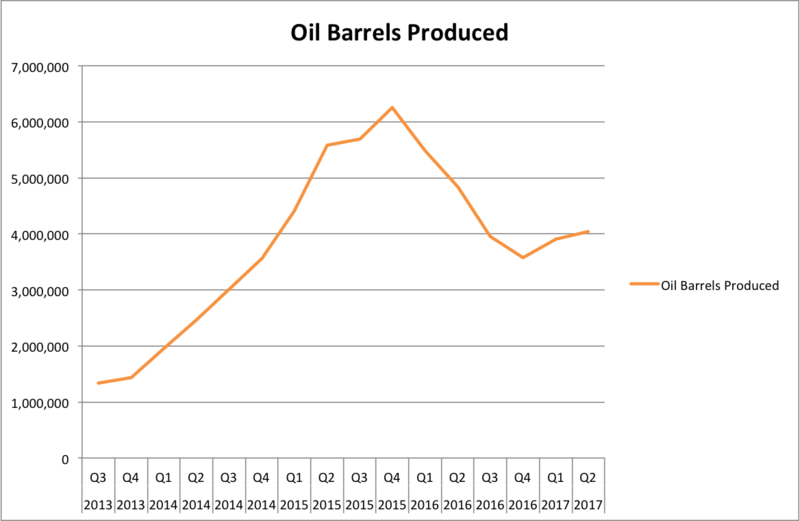 The largest production increases on a quarterly basis that we have seen in the ODNR’s statistics is oil increasing 26% in the second quarter of 2015 (going from 4,401,687 in first quarter, to 5,578,255 in the second) and natural gas increasing 23% in the fourth quarter of 2015 (going from 245 bcf in the third quarter, to 404 bcf in the fourth quarter). Since both of those quarters, if production was not decreasing—which it did at one point for both products—we have only seen single digit percentage increases. When looking for an overall trend of a cyclical industry, a quarter-by-quarter comparison over a number of years tends to provide the most accurate representation. We are encouraged to see that oil and natural gas producers are slowly ramping back up. The past two years brought a crippling downturn for the industry and this new sign of life is definitely welcomed by the industry. Ms. Ortwein will discuss Maximizing Shale Development through Technology and Innovation, sharing her perspectives on emerging innovations in energy development, infrastructure, and manufacturing in the Appalachian Basin and around the world. She also will address the current state of the industry, the economic challenges experienced by producers in the Appalachian Basin, and the need for greater policy certainty to encourage long-term capital investments by the oil and gas industry. With a career that spans leadership posts in ExxonMobil’s Development Company, Upstream Research Company, and other senior positions prior to being named XTO Energy President in 2016, Ortwein is uniquely positioned to bring insights from one of the world’s largest integrated energy corporations to the conference audience. * A group consists of four (4) or more attendees from the same company. To qualify for group rates, all attendees must be registered in one transaction. For Academic, Government, and Non-profit rates, click here. Please forward this email to your network of associates so they can experience the nation’s foremost gathering of business, technical and policy leaders focused on shale development. 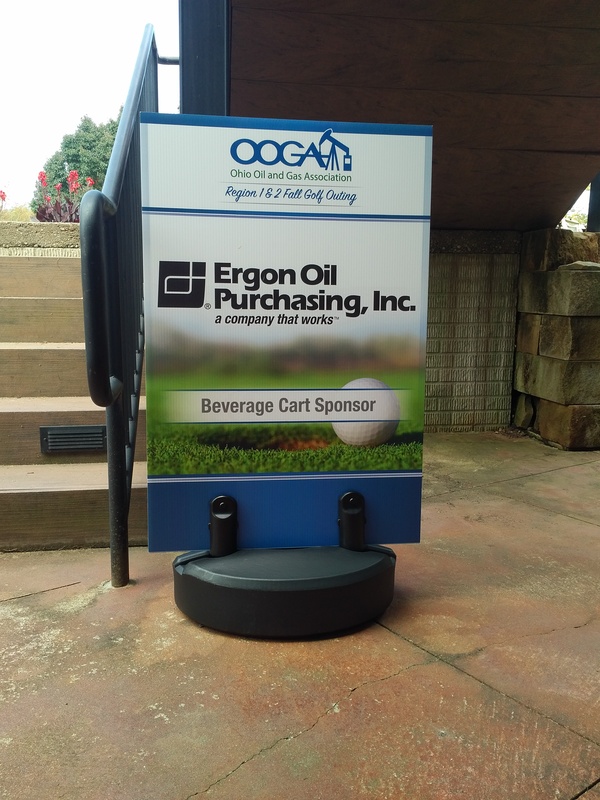 The OOGA held its annual Summer Meeting at the Zanesville County Club on August 7-8 with more than 325 attendees. The event opened with a breakfast business session, which provided a legislative review focusing on the State’s recent raids of oil and gas well funds to fix state budget holes. Once the rain passed on Monday afternoon the sun shined bright for the rest of the event allowing all attendees to enjoy the beautiful venues for golf, shooting and fishing. This year recreational catch and release fishing was added as a new sporting event. Luburgh Inc. hosted the OOGA for fishing at its beautiful private pond, stocked with bass, catfish and bluegill. In the evening event goers met back at Zanesville Country Club for the annual Oilfield Patriot Award dinner, sponsored by Producers Services Corporation. It was a very special event, as brothers Frank and Doug Gonzalez were presented with the 2017 Oilfield Patriot Award, the first duo to ever receive the award. They were honored for their long-time advocacy on behalf of the industry, which has included working with state legislators and getting involved within the Ohio Oil and Gas Association since the late 1980s. The co-owners of GonzOil based in Canton and have been successful independent oil and gas producers in Ohio for nearly three decades. Following the ceremony, OOGA hosted a new welcome networking reception at Zanesville Country Club that was well attended. The second day kicked off with golfers participating in a relaxed recreational golf scramble at Zanesville Country Club while another group of golfers participated in competitive stroke play at The Virtues Golf Club (formerly Longaberger). Additionally, shooters met at Briar Rabbit Shooting Spots for the Ken Miller Supply Clay Shoot. Afternoon activities at the Zanesville Country Club included a corn hole competition and putting contest. As the event drew to a close during the Dinner and Awards Presentation Shawn Bennett and Jim Aslanides presented the sporting competitions awards and door prize packages. The Association would like to thank everyone whose attendance and participation in the 2017 Summer Meeting contributed to its success. Finally, a big thank you to ALL of our sponsors including our premier sponsors: Ergon Oil Purchasing, Inc. and Ergon Trucking, Inc., Antero Resources and American Refining Group, Inc. We look forward to seeing you at our next OOGA event—the Technical Conference and Oilfield Expo, being held on November 1-2, 2017 at the Pritchard Laughlin Civic Center in Cambridge, Ohio. Governor Kasich signed House Bill 133, the State Lands Leasing Bill, into law back in 2011. The Governor did not have to sign the bill into law, he could have waited ten days (excluding Sundays), not signed the bill and it would still have become effective law. Or, at the time, the Governor could have vetoed the bill, which would have killed it. However, Governor Kasich chose to place his signature onto House Bill 133 to make it effective Ohio law. He, in turn, agreed to the bill and all of its tenants of law. As a part of that bill, appointments to the Oil and Gas Leasing Commission were to be made. These appointments were required by law to be done by the end of October, 2011. October came and went and nothing happened. State legislators inquired to both the Governor and other members of the administration as to when to expect these appointments. Again, nothing happened and they were continued to be greeted with silence. Governor Kasich has failed to perform his duties as required under Ohio law. So, after acting within the proper channels, the state legislature took action, removing the appointment authority from the Governor and providing this authority to the leaders of both the Ohio House and Senate. They did so by including it in the state budget bill. Again, even six years later, nothing prevented Governor Kasich from appointing members to the leasing commission. But the Governor continued to remain silent. Since this language was included in the state budget bill, Governor Kasich utilized his authority to line-item veto the measure which he clearly has the right to do. However, per Article II, Section 16 of the Ohio Constitution, the Ohio House also had the right to start the process of overriding the Governor’s veto. To do so, a super majority of three-fifths of members are needed to override. Why should the will of 67 members of the Ohio House and their associated constituents be silenced due to the opinion of one person? Those members utilized their constitutional authority to assert their will and require that these appointments take place. They represent landowners – constituents - whose adjoining properties next to state lands could have been leased and who would have received the associated benefits of mineral production for the past six years. We agree with the Ohio House that six years of inaction is long enough. Finally, in a recent opinion piece by Thomas Suddes that ran in the Columbus Dispatch and the Cleveland Plain Dealer, he points out that the first version of the Ohio Constitution initially provided the state legislature with the authority to make appointments. As he states, that power was taken away because it was abused. Is this not what is currently happening with this Governor? With no repercussions for the failure to appoint, the Governor has ultimately chosen this path and, in turn, has forced onto the legislature the associated response to override his veto. For the statutorily required process of state-lands leasing to begin, these appointments are required. Since Governor Kasich has neglected this duty, the Ohio House through their actions has stated enough is enough. The process to start the conversation for utilizing state-owned oil and gas resources for the benefit of the state, adjoining landowners, and its citizens must begin. Ohio law demands it. We urge the Ohio Senate to act to override the Governor’s line item veto. The OOGA encourages anyone in the industry to call/email Senate President Obhof to override the veto on oil and gas lease appointments!